Note: This is the first in our "They're leaving money on the table" series, where we actually test out and find which companies are leaving an enormous amount of cash on the table through improper pricing. Let us know who we should test next by emailing LeakingRevenue@PriceIntelligently.com. While we're rooting for Groupon to figure their issues out, we unfortunately found a huge chink in their already lightening armor that goes beyond local business relations or user acquisition: their color scheme. Kidding. We're a pricing blog. Of course, we wouldn't write an article unless it was their pricing. Through our study, we've discovered that Groupon is losing roughly $1,117,808 per day (or $408 million/year), and that's a conservative estimate. Sounds absurd right? Well, let's walk you through our study, show you the facts and calculations, before illuminating some ways you can avoid falling into a similar trap. 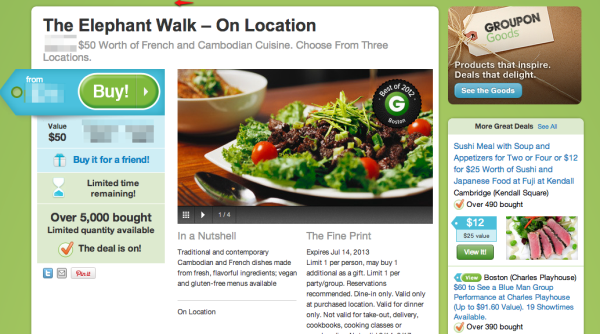 Groupon's revenue model is pretty simple. The basic premise is that they take a local business (such as a restaurant), cobble together a deal ($25 for $50 worth of food), sell the deal (yum! 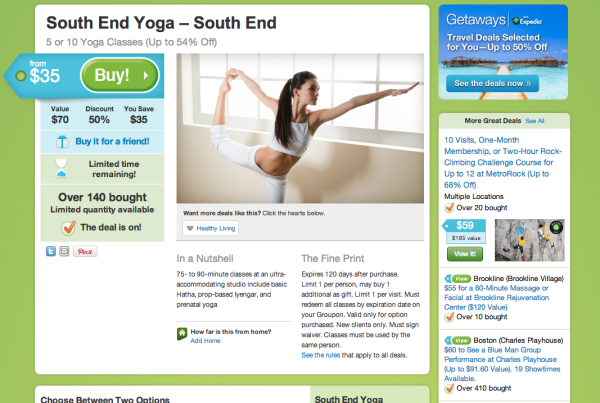 ), and then split the sale in some proportion ($12.50 to Groupon and $12.50 to the merchant). The exact proportion varies per deal, but we've seen the standard in our research be around a 50/50 split. Why would anyone agree to such a deal? Well, Groupon pitches their flock of daily dealers as a method for not only infusing your business with customers who may not come in without an extra nudge, but as a way to increase customer retention and repeat customer rates. After all, retailers don't win unless their doors are revolving. Many retailers question the validity in Groupon's retention and loyalty averages with many reports stating those claiming Groupon's deals are simply bargain hunters who refuse to come back to the establishment, but regardless, people are still buying (thousands per day) and it appears Groupon is working hard to turn their retention and repeat rate averages around. For the Groupon studies we quite literally took the deals right off the website and told the respondent that they were pricing a daily deal from Groupon with a value of $X, where $X was the strike out price on the deal. For example, for the deal below, we showed respondents the deal, including all the fine print and features, and told them that the deal was for $50 at The Elephant Walk. We obviously hid the Groupon sale price and discount percentage. We then priced the deal out and found the willingness to pay. For respondents, we used one of our panel partners to find individuals who: 1. have a Groupon account, 2. purchased a daily deal in the past two weeks, and 3. self identified as being interested in the deal (i.e.. said "Yes" to "Would you be interested in a deal from a Cambodian/French restaurant?"). Essentially, we wanted to make sure these folks were in the target demographic. Just a quick note: IPP stands for Indifference Price Point, and is where half the respondents believed the item was expensive and half believe it inexpensive. The point is a phenomenal one to look at, because it serves as the middle point of the data, allowing you to compare across different campaigns and studies. To summarize the above, we found that at least for these two deals Groupon could raise the actual sale price by over 40% and still bring in the bacon. How does this equate to such big yearly and daily losses? Now to get to the big numbers we quoted above we did some digging. In 2011, Groupon sold over 170 million deals (PDF) with an average amount of revenue per deal of about $12 (we say about, because we could only find the average for the first three quarters of 2011). If Groupon increased that average revenue per deal by 20% (we're being really conservative here and not going for the whole 44-61%) they could bring in an additional $2.40 per deal, which equates to an additional $408 million, or $1,117,808 million per day. 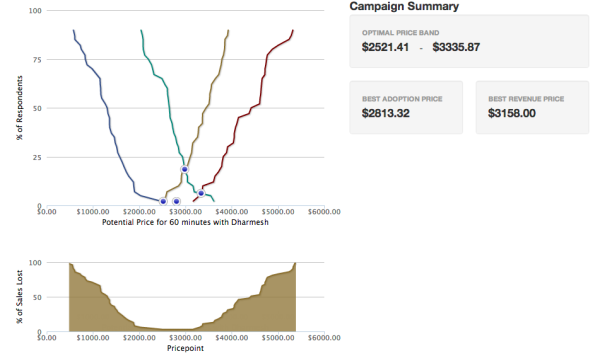 That's a lot of cold hard cash for everyone, just by being smarter about the structure and price point of their deals. Now admittedly, there are a lot of additional factors at work here, including the scale of Groupon offerings, the segmentation of each deal (different markets = different price sensitivities), the nuances of Groupon's accounting, and the like. Yet, the big lesson staring us all in the face is that Groupon is leaving cash on the table by not providing their business customers with insight into how to structure the pricing of their deals and what the delta should be between their list value and strikeout price. From an investment point of view, this data should be startling, because even leaving $100 million on the table at a company that's been struggling to meet earnings and losing day in and day out in the Wall Street game would be a lot of cash, let alone $408 million. Plus, in a business that struggles to get beyond barrier to entry and cost of user acquisition issues, there's clearly a more innate, easily adjustable solution to maximizing the revenue out of the volume of deals Groupon prints on a daily basis. I'm not sure what pricing analysis Groupon currently does, if any, but from reading numerous accounts of small business owners using Groupon, it appears they put a lot of the deal structure in the hands of the actual business with only light guidance from the sales rep and some historical data. Clearly, something needs to change. For you, this data should be indicating that you need to take pricing seriously or at the very least rethink your pricing process. Think about how you're currently pricing, how you can determine your customer base's willingness to pay, and how you can bring some data into the mix. A process and data. That's all you need.